The Lady Liberty stamp went on sale December 1 paired with with a flag stamp. Washington (CNN) -- When the U.S. Postal Service printed 3 billion stamps last year, it thought the image was of the Statue of Liberty, the iconic symbol of freedom keeping watch over huddled masses yearning to breathe free. But a sharp-eyed stamp collector uncovered the truth. The image on the 44-cent stamp was of a replica of the Statue of Liberty more than 2,000 miles away, keeping watch over throngs of sweaty Vegas tourists yearning to get rich. The U.S. Postal Service on Friday confirmed that the image was of the statue at the New York-New York Hotel & Casino, a fact that was made known to them by a stamp collector a few weeks ago. But, attempting to make the best of an embarrassing situation, the Postal Service said it would have picked the image anyway, and it said news of the mistake has added enthusiasm to the stamp-loving masses. "We really like the image and are thrilled that people have noticed in a sense," spokesman Roy Betts said. "It's something that people really like. If you ask people in Vegas, they're saying, 'Hey, That's great. That's wonderful.' It's certainly injected some excitement into our stamp program." 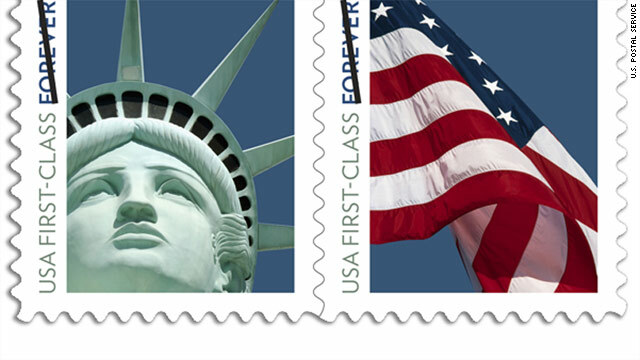 The Lady Liberty stamp went on sale December 1 paired with a flag stamp. Betts said the Postal Service obtained the image from a photo service, which had misidentified the image as being the Statute of Liberty. Consequently, the Postal Service also identified the stamp as being the original Statue of Liberty in materials about the new stamps, Betts said, but it has since rectified the error. The stamp is a "Forever" stamp, meaning its value is always equal in value to the current First-Class Mail 1-ounce rate. Betts said the stamp design was reviewed by a citizens stamp advisory committee, which endorsed it. But a stamp collector "brought it to our attention" that the image was of the casino statue a little less then a month ago. "We immediately started to go into a research mode," Betts said. "Once we got confirmation that it was the replica, then we started to make the necessary changes in our description, and then we started to look at our own internal processes." Betts said the Postal Service never considered withdrawing the stamp. "There's no reason to," he said. "There's no error on the artwork. It's not as if we are saying this is Lady Liberty and we are showing a picture of some other lady." "We would have used this image anyway," he said. "We were looking for a different treatment of this icon that has been on 23 different stamps previously."